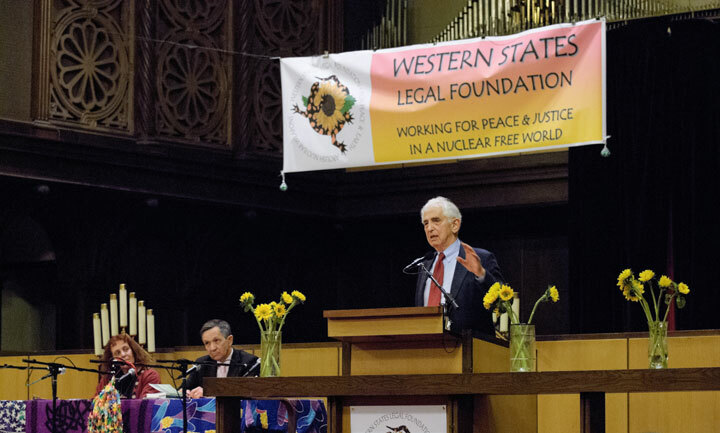 In February, Western States Legal Foundation celebrated its 30th anniversary at the First Congregational Church in Oakland with a reception and an evening of lively discussion about prospects for disarmament in the current global context. For more on the event including full video of talks by Kucinich, Ellsberg, Lee, and WSLF Executive Director Jacqueline Cabasso, click here. Western States Legal Foundation (WSLF) is a non-profit, public interest organization founded in 1982, which monitors and analyzes U.S. nuclear weapons programs and policies and related high technology energy and weapons programs, with a focus on the national nuclear weapons laboratories. WSLF recognizes that nuclear weapons affect the environment, the economy, the role of violence in society, and democracy itself. Rather than enhancing our "national" security, nuclear weapons threaten our fundamental human security. WSLF seeks to abolish nuclear weapons, compel open public environmental review of nuclear technologies, and ensure appropriate management of nuclear waste. Grounded in nonviolence and rooted in both international and environmental law, the principle guiding WSLF's activities is democratization of decision making affecting nuclear weapons and related technologies. Research and analysis on current U.S. nuclear weapons policies, ongoing nuclear weapons research, testing, and production activities, and their impacts on international security. Research and analysis on other high technology weapons programs, such as ballistic missile defense and efforts to further militarize outer space, which threaten international stability and make the elimination of nuclear arsenals more difficult to achieve. Assisting communities affected by the health and environmental impacts of nuclear weapons research and production and of other nuclear technologies. WSLF is a founding member of the Abolition 2000 Global Network to Eliminate Nuclear Weapons. WSLF has been a member since 1989 of the Alliance for Nuclear Accountability, and is affiliated with the International Association of Lawyers Against Nuclear Arms, the International Peace Bureau, and the Global Network Against Weapons and Nuclear Power in Space. "It's Not Enough to Declare 'No First Use'" Op ed by WSLF Senior Research Analyst Andrew Lichterman, Truthout, February 19, 2019. "As Treaties Collapse, Can We Still Prevent a Nuclear Arms Race?" Op ed by WSLF Executive Director Jacqueline Cabasso Christine Muttonen, Jacqueline Cabasso & Alyn Ware, Interpress News Service, February 4, 2019. The Evolving Situation on the Korean Peninsula: Time for a Northeast Asia Nuclear Weapon Free Zone? Rethinking the Military-Industrial Complex Western States Legal Foundation working paper 2018, by Andrew Lichterman. Join the No Nukes! No Wars! No Warming! contingent in the September 8 Rise for Climate, Jobs and Justice March in San Francisco. On Eve of Korea Summit, US Conference of Mayors Urges President Trump to "Patiently and Diligently Work with North and South Korea for a Formal Resolution of the Korean War and Normalized Relations with a Denuclearized Korean Peninsula." Risk Without Representation: Nuclear Weapons in the 21st Century Presentation of the Western States Legal Foundation to the 2018 Preparatory Committee Meeting for the 2020 Nuclear Nonproliferation Treaty Review Conference. Video: Bonkers! Trump's New Nuke Policy, A conversation with Jackie Cabasso, Executive Director, Western States Legal Foundation. From Nobel to Nobel: December 10th - Celebrate the 2017 Nobel Peace Prize and Western States Legal Foundation's 35th anniversary! U.S. Conference of Mayors Unanimously Adopts Mayors for Peace Resolution "Calling on President Trump to Lower Nuclear Tensions, Prioritize Diplomacy, and Redirect Nuclear Weapons Spending to meet Human Needs and Address Environmental Challenges"
Peace and Planet Conference in NYC: No Nukes, No Wars, No Walls, No Warming, Brooklyn, New York, June 18, 2017. Conference video now available. The Nuclear Dilemma Today: Avoiding Catastrophe in a World of Eroding Norms Presentation of the Western States Legal Foundation to the 2017 Preparatory Committee Meeting for the Nuclear Nonproliferation Treaty Review Conference, by Andrew Lichterman, Vienna, May 3, 2017. Defend the Unequivocal Undertaking to Eliminate Nuclear Arsenals, International Association of Lawyers Against Nuclear Arms Presentation of the International Association Of Lawyers Against Nuclear Arms to the 2017 Preparatory Committee Meeting for the Nuclear Nonproliferation Treaty Review Conference, delivered by Jacqueline Cabasso, Vienna, May 3, 2017. Nuclear Double Standards: All Nuclear Weapon Tests Send the Same Message Buzzflash.com, April 26, 2017, by Andrew Lichterman, WSLF senior research analyst. Video: Trump and the Bomb, A conversation with Jackie Cabasso, Executive Director, Western States Legal Foundation, Peninsula Peace and Justice Center, February 8, 2017. "A circle that can't be squared: Broad-spectrum arms racing and nuclear disarmament," book chapter in new UN publication. Disarm Now: We Stand with Nuclear Survivors for Global Justice: Rally and Nonviolent Direct Action at Livermore Nuclear Weapons Lab on Tuesday, August 9, the 71st anniversary of the U.S. atomic bombing of Nagasaki..
U.S. Conference of Mayors Unanimously Adopts Resolution "Calling on the Next U.S. President to Pursue Diplomacy with Other Nuclear-Armed States; Participate in Negotiations for the Elimination of Nuclear Weapons; Cut Nuclear Weapons Spending and Redirect Funds to Meet the Needs of Cities"
70 Years of Nuclear Weapons:At What Cost? Philip MuIdari interviews WSLF Executive Director about the Iran nuclear agreement. Nuclear Affairs: What in the World is Happening? WSLF event at Cafe Valparaiso, Albany, Thursday July 23, 2015. U.S. Conference of Mayors Adopts Resolution "Calling for Effective Implementation of the Nuclear Non-Proliferation Treaty Disarmament Obligation and Redirection of Nuclear Weapons Spending to Meet the Needs of Cities"
Peace and Planet Mobilization Op Ed, MLK's Call to Honor Peace, Justice and Our Planet Still Challenges Us. Press conference: No New AUMF-- End Endless War! Nuclear Weapons and Climate Change in the Age of Corporate Globalization, WSLF Information Brief, Fall 2014. Dinner—Music–Information at Café Valparaiso-- WSLF benefit and updateCafé Valparaiso, 1403 Solano Ave, Albany, June 26, 6pm. Report from the 5th Nagasaki Global Citizen's Assembly for the Elimination of Nuclear Weapons November 2--4, 2013. Film screening of the Ultimate Wish: Ending The Nuclear Age and panel discussion, New York City, September 26. With WSLF Executive Director Jacqueline Cabasso. Photos now available from our 30th Anniversary celebration! News Flash: Mayors for Peace resolution CALLING FOR U.S. LEADERSHIP IN GLOBAL ELIMINATION OF NUCLEAR WEAPONS AND REDIRECTION OF MILITARY SPENDING TO DOMESTIC NEEDS passed by U.S. Conference of Mayors. Issue Update: Subcritical Tests, Western States Legal Foundation, Fall 2012. Nonviolence or nonexistence, democracy or nonexistence, Andrew Lichterman, address to Hiroshima remembrance gathering, August 5, across the street from the Lawrence Livermore National Laboratory, Livermore, California. Atoms for Peace,Then and Now, Western States Legal Foundation Commentary, Summer 2012. Rhetoric vs. Reality: Nuclear Dangers in a Time of Growing Global Economic and Environmental Crisis, Western States Legal Foundation Information Bulletin, Spring 2012. WSLF board member Andrew Lichterman on KPFA Radio's Against the Grain, February 3, noon. U.S. Conference of Mayors unanimously adopts resolution "Calling for U.S. Leadership in Global Elimination of Nuclear Weapons and Redirection of Military Spending to Domestic Needs"